A man believed to be a leader in the Gambino crime family was shot to death outside his home on Staten Island, a law enforcement official briefed on the case and two other sources said. Michael George reports. 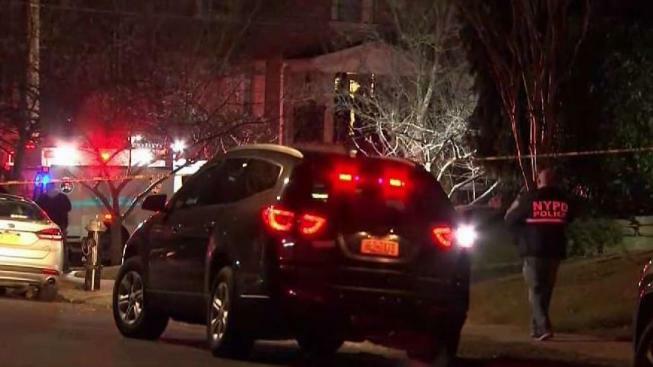 A man believed to be a ranking member in the notorious Gambino crime family was shot to death outside his home on Staten Island Wednesday night, police and a law enforcement official close to the investigation said. Police responding to a 911 call around 9:20 p.m. found Francesco Cali, 53, shot outside his home on Hilltop Terrace in Todt Hill. The 911 caller had initially reported a man had been run over by a vehicle on purpose and that he was trapped; the caller then said he had also been shot multiple times. Cops found Cali with gunshot wounds to the torso; he was pronounced dead at a hospital. A suspect fled the scene in a blue pickup truck, the NYPD said. Authorities canvassed the scene overnight, roping off the entire front yard as evidence markers littered the pavement near an SUV parked out front. The last crime family boss to be shot in New York City was Paul Castellano. The Gambino crime boss was assassinated outside Sparks Steakhouse in Manhattan in 1985. The family was once among the most powerful criminal organizations in the U.S., but federal prosecutions in the 1980s and 1990s sent its top leaders to prison and diminished its reach.